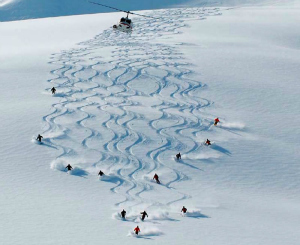 You’ve made the big commitment to seek out the best powder skiing of your life with a heli skiing trip, now all you need to do is to make sure you maximise your heli skiing experience so that it really is the ski trip of a lifetime. It’s a simple one, but in our experience the more fit you are the more you will enjoy your heli skiing trip (and we believe that goes for seasoned pro’s as well as heli ski first timers). The reality of heli skiing is that with a powerful and speedy helicopter whipping you up the mountain for every run you will ski significantly more than on your standard resort skiing or off piste ski holiday. 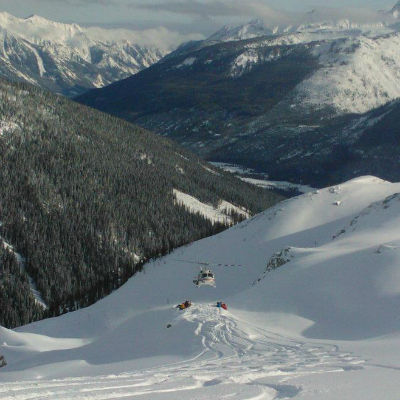 Expect to heli ski 8 to 12 runs in a day and up to 50,000 vertical metres in a week! Check out our ski fitness page for top heli ski fitness tips. As the boy scouts put it “by failing to prepare you are preparing to fail”. We recommend making sure that when you step out of the helicopter at the top of your first heli skiing run it’s not the first skiing you’ve done all season! Hit the pistes in Europe before your trip to warm up your legs (nice short turns and moguls will get you in the right rhythm) or arrive at your heli ski destination a few days early and get-over the jet lag while finding your ski legs again. Given that you are spending a significant amount of money and probably travelling a long way, don’t let the small things get in the way of an incredible heli skiing experience… In our experience there are 3 crucial things you need to get right. One, have a good layering system for your clothes so that you can add or subtract layers to suit the conditions. One of those small down jackets is a perfect friend to have stuffed into a back-pack ready to come out if it’s getting icy. Two, make sure you have good gloves (good = warm and waterproof) and ideally ones with a long sleeve to keep the powder out. It’s amazing how quickly the rest of the body feels the cold if your hands are cold. And three, invest in some great goggles that don’t fog-up! Normally that means goggles that have a decent amount of space between your face and the lens. Our friends at Ellis Brigham can get you kitted up for heli skiing, or most of our operators have specialised kit you can buy at their lodges. Ski tech has come on so fast recently it’s hard to keep up… Reverse camber, rocker technology, sidecuts… it can get pretty confusing fast. Our suggestion would be to leave the ski selection to the professionals and take the advice of the ski tech at the heli ski operator who will set-you up with the best powder skis available. Tip number two – arguably the most important in the list – ensure your heli ski poles are 5cm shorter than those you usually ski with on the piste. 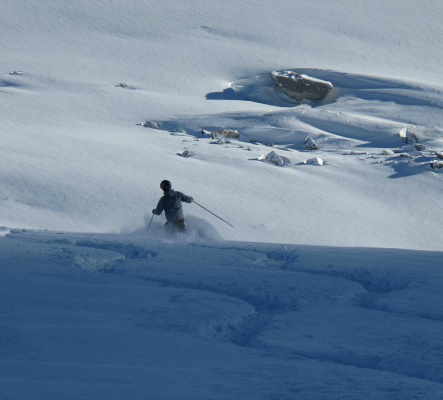 This will make sure you are weighted forward and in the perfect ski position to attack the powder! It’s easy to forget when you’re crouching down in a huddle as a helicopter lifts off in a cloud of snow that whilst the mode of transport might be extreme, heli skiing is as extreme or as gentle as you want it to be. Despite perception to the contrary your usual heli skiing run will be a lovely gradient red run – just with no people and (hopefully) perfect powder! Just remember that you can ski and don’t let the novelty of your helicopter/taxi knock you off your rhythm and most importantly have fun – its most probably going to be the best skiing of your life! Simply can’t wait any longer? Have a look for the perfect skiing trip this Winter or contact us to discuss your heli skiing trip. If it’s still a faraway dream you can enter our competition in conjunction with Ellis Brigham, Arc’teryx and K2 skis for a chance to win a heli skiing trip!